With the new academic year upon us and with so much happening in the world, I thought that it would be inspirational to share some great news. For this blogpost, I am wearing my "Academic Mom" hat as the chair of doctoral students' dissertations. Getting a PhD is one milestone, getting a good job afterwards is another, and getting promotion and tenure, yet another big achievement. 2012 has been quite an eventful year for several graduates of our Isenberg School of Management PhD track in Management Science program at UMass Amherst, but, then again, I am biased, since I was their dissertation chair. I always say that "Good news happens in threes." Earlier, I had shared that my former doctoral student, Dr. Jose M. Cruz (with the 5 UMass Amherst degrees) had been named an Ackerman Scholar. He has also been promoted to Associate Professor with tenure at the School of Business at the University of Connecticut Storrs. He is now the Interim Director of the Business Analytics and Project Management Master's program at UConn. In addition, Dr. Ke "Grace" Ke was also promoted to Associate Professor with tenure at the College of Business at Central Washington University. She was also my doctoral student at the Isenberg School. And, just this past week, my former doctoral student, Dr. Fuminori Toyasaki, informed me that he was promoted to Associate Professor with tenure at the School of Administrative Studies at York University in Toronto, Canada. Prior to joining the faculty at York University, he had had a two year fabulous postdoc at McGill University in Montreal and worked there with our esteemed colleagues, Professor Vedat Verter and Professor Tamer Boyaci. In the photo above, from a few years back, I am standing with (l-r) Dr. Fuminori Toyasaki, Dr. Tina Wakolbinger (who is now a Full Professor at the Vienna University of Economics and Business), Dr. Ke "Grace" Ke, Dr. Jose M. Cruz, celebrating the visit of Dr. Patrizia Daniele of Italy nd her husband, along with Dr. Dmytro Matsypura (who a year or so ago received tenure at the University of Sydney), and Dr. Zugang "Leo" Liu of Penn State University Hazleton. It is great to see Operations Research and Management Science thriving! You can find the titles of their PhD dissertations and the abstracts, along with links to several of their publications on the Supernetworks website. We are now marking the first anniversary of Hurricane Irene that had a devastating impact on the Northeast and our area of western Massachusetts with flooding of schools, farms, and businesses that we all hold dear. Deerfield Academy, my daughter's alma mater, is even marking the first anniversary with a benefit concert tonight entitled, "Goodnight Irene." The impacts of Hurricane Irene resulted in a once in 500 years flood in the Deerfield area and affected not only Deerfield Academy, the much-loved Bement School, but also the Deerfield Inn, and the neighboring farms. The impacts resonate to this day. Now the states along the Gulf Coast are preparing for Hurricane Isaac, and, hopefully, the lessons learned from Hurricane Katrina, which marks its 7th anniversary, ironically, this Wednesday, have been learned. From the prepositioning of supplies to disaster communications to the evacuation of residents -- let's hope that the impact this time is nowehere at the level of pain, suffering, and economic losses as in the past. Such disasters inspired me to teach a new course at the Isenberg School of Management on Humanitarian Logistics and Healthcare and Katrina also, in part, inspired a workshop that I led on Humanitarian Logistics at the Rockefeller Center's Bellagio Center in Italy. Professor Emmett Lodree at the latter gave a presentation on "Inventory Planning for Hurricane Events," in which he spoke of his personal experiences with Katrina, which is grandmother survived but which flooded her home and showed how science in the form of weather forecasting and operations research modeling could enhance emergency preparedness and disaster relief. As colleges and universities gear up for the new academic year, it is also a time to begin planning for conferencing. The Annual INFORMS Conference is always a highlight -- bringing together operations researchers and management scientists from around the globe to exchange their latest research, to reconnect, learn from one another, and also to network and to see old friends and to make new ones. This year the INFORMS Conference will take place in Phoenix, Arizona, October 14-17, 2012. In addition to the various society business meetings, which I also enjoy, one of the BEST events is the Women in Operations Research and the Management Sciences (WORMS) luncheon. The meal is always delicious and at this luncheon the WORMS Award is given. I posted some photos from an earlier WORMS luncheon here. This year, tickets will no longer be sold at the lunch so please plan accordingly, since we don't want disappointed colleagues! We expect room for 200 at the lunch. Below is the email that was just circulated to the WORMS community which I am reposting for communication purposes. I am writing to invite you to the annual WORMS luncheon that will be held on Tuesday, October 16, from 12:30-1:30 at the Hyatt Hotel in Phoenix, AZ. This will be another great networking and celebration event for women in OR/MS and other supporters of diversity in the profession. Luncheon tickets are $18 ($8 for students). You can purchase tickets when you register for the INFORMS conference at http://meetings2.informs.org/phoenix2012/register.html, or during on-site registration when you arrive in Phoenix (if tickets last). Different from the earlier years, we will not be able to sell any tickets at the door, and only those who can present tickets will be admitted to the luncheon. Traditionally, WORMS luncheons have been very popular and previous years' luncheons consistently sold out, so please purchase your tickets early! During the luncheon, we will be presenting the WORMS award for the Advancement of Women in OR/MS. We have been fortunate to secure sponsorships from various institutions, and we will be hosting a table with our sponsors' recruitment materials and job ads, which we believe will be an excellent opportunity for networking and visibility. We are looking forward to seeing you in Phoenix! Please join us at the WORMS luncheon! I think that many of us, tonight, when the sun sets, will go outside and look at the moon and marvel at one of mankind's extraordinary scientific achievements -- when Neil Armstrong, the first man, walked on the moon. He was the commander, at age 38, of the Apollo 11 mission that landed him in the lunar module on the moon on July 20, 1969, with fellow astronauts Buzz Aldrin and Michael Collins. Many of his quotes are legendary and, in his honor, I repeat my favorite one. As he stepped off the lunar module and set foot on the moon's surface, he said: That's one small step for man, one giant leap for mankind. His death was preceded one month ago by the death of another astronaut who made history/herstory -- Sally Ride, who was the first female in space. I have just come back from a long walk with many neighbors asking "How was your daughter's move-in to college?" Wearing a "parent" hat, rather than an "academic" hat, and reflecting on my own move-in experience freshman year, I was very impressed as to how well-organized, painless, and, actually, very pleasant the whole experience was. Some colleges have figured out systems to make what could be a very tiring, onerous process flow well and efficiently, and as someone who teaches operations, I care about having processes work and flow well. We had driven our overloaded Volvo with a carrier on top, and, after overnighting in a local hotel, proceeded to her college. We followed the directions that we were given, parked our car a few feet from my daughter's dorm, and there was a group of upper classmen in nice college t-shirts just waiting to carry all the labeled boxes to her dorm room. We even had members of the college football team (Division 1 for those who care about such things) complete the job. It took no more than 15 minutes! Her room is on the second floor but I counted 3 short flights of stairs to get there. Coaches were driving around providing water and energy drinks. My daughter managed to unpack and organize many of her belongings and then her room-mate came. It was wonderful how they had communicated beforehand to determine who would bring what that they could share. While the room-mates were getting to know one another and organizing their room, I had time to meet many of her dorm-mates, their parents, and relatives. It is a very good sign when the conversations with so many of the parents are so enjoyable that you wish that you can continue talking for hours (this also brings a sense of relief). Afterwards -- certain colleges certainly do move-in days nicely -- during the convocation and even reception with the College President and his wife, we met a family from the Philippines, a girl from Madagascar, and several new freshmen from China, plus families that had come from California, Idaho, Montana, and Nebraska to situate their college freshmen. When I was dropped off as a freshman at Brown University I had a minimal amount of clothes (but I did take some of my paintings that I had done) and my freshman room-mate, who was from Kansas, and one of only two engineering majors that year, had already picked her side of the room. We had a room at the end of the corridor and now so does my daughter. Now for those who have dorm rooms in high rises (some of my daughter's friends will be living in rooms above the 20th floor at their universities), the scheduling of arrivals has been done with great finesse. Let's hope that the elevators work throughout the process. The New York Times has an article on college move-in day but I especially enjoyed Professor Boylan's essay on "A Freshman All Over Again," in which she wrote about her son's move-in day into Vassar and reflected on her freshman transition at Wesleyan University. The comments from readers on the latter piece are very engaging and here we go again with the deja vu. I tell my students to read not only books but also such publications as The New York Times and The Economist. I believe that the real world can and should inspire research and those who are curious and care about solving problems can find many challenging problems out there. One of our most recent papers was of modeling competitive food supply chains with a focus on product perishability through the use of arc multipliers and generalized networks. The paper, Competitive Food Supply Chain Networks with Application to Fresh Produce, Min Yu and Anna Nagurney, is now in press in the European Journal of Operational Research. In the paper, which utilizes game theory and variational inequality theory for formulation, analysis, and computations, we also presented a case study, focused on the cantaloupe market, in the scenario of a foodborne illness, that was inspired by an actual outbreak that occurred a while back. Now USA Today is reporting, that the Latest deadly salmonella outbreak angers food-safety experts. Agricultural experts say the frequent problems with cantaloupes come from the nature of the melons and sloppy agricultural practices. In the latest outbreak, the Centers for Disease Control and Prevention (CDC) said, two people have died and 141 have fallen ill in 20 states in a salmonella outbreak linked to contaminated cantaloupe grown in southwestern Indiana. Thirty-one victims have been hospitalized. Both deaths were in Kentucky. Last year's epidemic was caused by cantaloupes contaminated with listeria, from Colorado's Jensen Farms, according to the CDC. We all know the importance of consuming fresh produce and how delicious ripe fresh fruit is -- at least we should be confident and secure that it will support health and not cause illnesses and death because of inappropriate handling and processing. In our paper, we show the economic impact of such a foodborne outbreak of the involved firms. As many high school graduates are preparing for their new lives as college students, it is special to see that some old traditions still matter. My daughter will soon be off to college and, as a 2012 Deerfield Academy graduate, she has been getting together with classmates and other friends before they embark on their new journeys in life and disperse to more than 50 different colleges and universities.. It was a challenging year for many with Hurricane Irene and the flooding, almost exactly one year ago, and the power outages during the freaky October "Halloween" snowstorm. Yesterday, and what could be more appropriate, she and a friend hiked to the Rock, which is an old Deerfield school tradition. 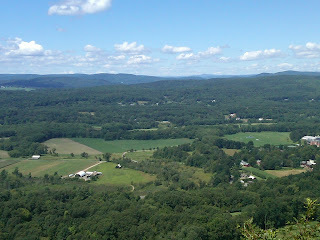 The day was picture perfect and the photo below is of the spectacular view (and reward) when one reaches the top. 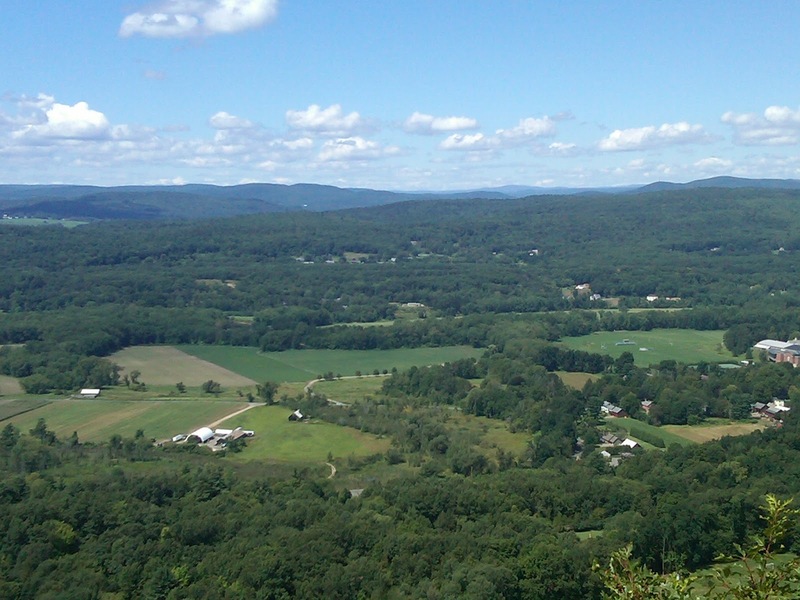 Western Massachusetts' beauty can be appreciated from this vantage point in any season. New traditions and rituals await but old school ties are strong and friendships made and lessons learned will sustain those on their new adventures. Who does not feel pressed for time -- whether dealing with deadlines, juggling family and work responsibilities, and/or just finding time for exercise and some leisure pursuits? Firms and organization are also pressed for time -- products that are produced and delivered that are spoiled, out-of-date, or out of style and fashion will just waste away on shelves and yield no revenues. Supply chains today span the globe and provide the infrastructure for the production and delivery of goods and services, with more knowledgeable consumers demanding timely deliveries, despite, paradoxically, the great distances that may be involved. Indeed, delivery times are becoming a strategy, as important as productivity, quality, and even innovation. Smart firms have realized that speed of product delivery is a competitive advantage. Whether in manufacturing (especially in build-to-order and made-on-demand industries such as certain computers, electronic equipment, specific cars, airplanes, furniture, etc.) or in digitally-based production and delivery (DVDs, online shopping, online content distribution, etc.) speed and consistency of delivery time are two essential components of customer satisfaction, along with price. Stalk, Jr., in his seminal Harvard Business Review 1988 article, ``Time - The next source of competitive advantage," utilized the term time-based competition, to single out time as the major factor for sustained competitive advantage. Today, time-based competition has emerged as a paradigm for strategizing about and operationalizing supply chain networks in which efficiency and timeliness matter. Consumers at the demand markets for the substitutable, but differentiated, products respond to both the quantities of the products and to their delivery times, as reflected in the prices of the products. In addition, by capturing the total cost associated with delivery times of each firm, along with their production costs and their transportation costs in their respective objective functions, the marginal cost of time can be quantified in this more general competitive supply chain network framework. The governing equilibrium concept in our supply chain game theory model was that of Nash equilibrium. By using the theory of variational inequalities we could not only formulate the problem but also effectively and efficiently solve it. It is not only what you produce and deliver -- knowing how long it will take to get to your customers is information that firms need and that customers respond to, through their wallets. In a recent post, I wrote about our paper on our National Science Foundation (NSF) project on a new architecture for the Internet, called Choicenet. Professor Tilman Wolf of UMass Amherst is presenting our paper "Choice as a Principle in Network Architecture" today at the ACM SIGCOMM conference in Helsinki, Finland. One of the Co-PIs on our project just informed me that our project is featured in the latest ACM Tech News, in an article with the catchy title, "The Future of the Internet is ... a la Carte." This NSF project is a collaboration of UMass Amherst with the University of Kentucky, NCState, and the Renaissance Institute, RENCI. NCState did the latest press release on our project and I now have two doctoral students working on it with us. Our group is also one of five selected for the Future Internet Architecture initiative by NSF, which is very cool. There is also some coverage of our project and paper by Kurzweil. I have seen several fallen multicolor leaves in Amherst, Massachusetts and there is now a "coolness" and "crispness" in the air, which are much appreciated. Hard to believe that it is now mid-August with a new school year upon us. Some of us have never left "school," and especially college. Even when I worked in industry, after getting two undergrad degrees from Brown University, I was still pursuing a Master's degree at Brown, and the companies that I worked for paid the tuition (thanks to Systems Consultants and Aquidneck Data Corporation in Rhode Island). After leaving high tech consulting, I got the PhD and then I was off to teach at UMass Amherst. Since then, I have had a fellowship at Harvard, two Fulbrights, and terrific visiting faculty appointments at MIT and at Brown, as well as at KTH in Stockholm, Sweden, and, most recently, at the University of Gothenburg, Sweden, where I am spending time on my sabbatical (and loving it). There is something about the pending Fall that floods one with memories, and, never more so than this year. I have several nieces and nephews and even my daughter who will be freshmen at colleges and some have already started their journeys to their college campuses. Who can ever forget one's freshman year and freshman "week" -- meeting one's room-mate, for the first time, taking that first exam in college, making friends from around the world, juggling courses, and a campus job, while finding one's true passions! Being a college professor is the greatest job -- there are always new ideas, new people, new courses to teach, new opportunities and new challenges. To see new students, whether the freshmen or the matriculating graduate students (and today I am meeting one of my new doctoral students, who has come from India to study management science), and to reconnect with former students is always special. 1. Do get to know your professors -- visit them during office hours -- they can connect you to alums, internships, and write those important letters for grad school or jobs. They can also answer questions that you may have on a topic. 2. Strike up a conversation with someone who looks in need of a friend -- whether in the cafeteria or in your class or dorm. Friendships made in college last a lifetime. 3. Do more than the professor assigns in class, whether by working through more calculus, physics, chemsitry, engineering, or accounting and economics problems, visiting museums, or starting a research project. There is great satisfaction from solving problems and getting greater confidence. 4. Take a course that intrigues you -- incoming art majors have ended up as doctors and incoming scientists as poets. 5. Take a computer programming course -- it will give you skills that you can apply immediately. 6. Read, read, read, and write at every opportunity. 7. Stay healthy and stay in shape. 8. If you can't find an extracurricular activity or club to join -- start one. Linda Tanner and I (beginning of Title IX days, which we at that time were not even aware of) helped to start the Brown University women's track team and cross-country team. We were thrilled when we got to pick our sneakers from a bin! There will be up times and there will be down times but the effort that you put into your college education will help to make you a creative, engaged, and happy individual, who can contribute to society in meaningful, substantive ways. Best of luck to all the incoming students! One of the best aspects of our National Science Foundation (NSF) project "Collaborative Research: Network Innovation Through Choice," is the numerous discussions that the investigators have been having. We (UMass Amherst, NCState, the University of Kentucky, and RENCI) have regular teleconferences and groups of us have met face to face at our respective institutions and at NSF events. The discussions that we have had on our project are always stimulating and it is interesting to see how well we can communicate even though we represent different disciplines. I must admit I get a special thrill when I hear terms that I often use in my network and supply chain research being used by computer scientists and engineers such as: perishable to robustness to network vulnerability to most efficient routing to, of course, a lot of network economics terms. I have been working with two doctoral students on modeling the behavior of the interactions among the decision-makers on what we are calling the economy plane. Next week is the 2012 ACM SIGCOMM Conference, which will be taking place in Helsinki, Finland. SIGCOMM is the flagship annual conference of the ACM (Association for Computing Machinery) Special Interest Group on Data Communication (SIGCOMM) on the applications, technologies, architectures, and protocols for computer communication. My colleague from UMass Amherst, Professor Tilman Wolf of the Department of Electrical and Computer Engineering, will be presenting our joint poster paper, Choice as a Principle of Network Architecture at this conference. Professor Wolf is the PI on this project and I am the Co-PI (for the UMass Amherst contingent). Our project, which is called Choicenet is one of the five NSF Future Internet Architecture projects, which is very cool and fascinating. I love math, science, and engineering, as well as economics, and especially how they can be integrated to formulate and solve problems facing our society. I would like to take this opportunity to congratulate the recently announced, by President Obama, recipients of the Presidential Early Career Awards for Scientists and Engineers, known as the PECASE Awards. There are 96 of them this year and they were honored by the President in a special ceremony. A UMass Amherst colleague, in polymer science, is one of the recipients of this award, which provides $50,000 for each of 5 years. His name is Dr. Alejandro Briseno, and he is a polymer scientist. A UMass PhD in kinesiology, Dr. Maria Urso, is also among ths year's PECASE awardees. According to a wonderful article on masslive.com, Dr. Briseno hopes that his research, one day, will not only lead to more efficient solar panels and LCD display screens, but that, also, it will lead to a new crop of young Latino scientists, especially ones growing up now in tough neighborhoods like his own Baldwin Park section of Los Angeles. He was a freshman in college when his father was murdered, shot six times in the head. Police never identified the killer. “I faced some challenges after that for the next six years of my life. I made a decision to pursue science,” he said. Beautifully said and truly inspirational. Time to stop dumbing down America and to create opportunities for all those who strive to achieve in the STEM fields. Congrats to all the PECASE recipients! I am in the process of writing a new book so it takes a lot to divert my attention. Dr. Sanjay Gupta's brilliant OpEd in yesterday's New York Times, "More is not always better in medicine," which has been reprinted on cnn.com not only have I read and reread but it deserves a commentary. Unlike Andrew Hacker's OpEd, also in the Times, to which I, and many of my colleagues, had strong negative reactions, I applaud Dr. Gupta's brilliant OpEd. Of course, the OpEd title itself intrigued me, especially the part -- more is not always better. Although his OpEd is focused on medicine, it reminded me of the Braess paradox in transportation and the Internet -- when adding capacity can actually make everyone (travelers, or computer messages) worse-off in terms of travel time. In that context, we also speak of the price of anarchy, which seems, to me, also very relevant in the medical context. His OpEd begins with the doctor's oath: "First, do no harm," and notes that, whenever a medical professional makes a mistake that affects a patient, this oath is violated.Coincidentally, this past Sunday, in holding a second and belated graduation party for my daughter, a mother of a fellow Deerfield Academy graduate, remarked to me, that, as a child of doctors, she would regularly hear: "Do no harm," and, interestingly, she brought this up in talking about college guidance counselors (I may cover that topic in a future blogpost). Dr. Gupta's major thesis is that, in practicing defensive medicine, with many more tests given to patients and medicines prescribed, patients are being injured, since the former may result in false positive results with infections and other complications possibly occurring and the latter may result in allergic reactions, or inappropriate treatments (and he gives examples from his own experiences). It is a given that American doctors perform a staggering number of tests and procedures, far more than in other industrialized nations, and far more than we used to. Since 1996, the percentage of doctor visits leading to at least five drugs' being prescribed has nearly tripled, and the number of MRI scans quadrupled. Each additional procedure or test, no matter how cautiously performed, injects a fresh possibility of error. Certainly many procedures, tests and prescriptions are based on legitimate need. But many are not. In a recent anonymous survey, orthopedic surgeons said 24% of the tests they ordered were medically unnecessary. This kind of treatment is a form of defensive medicine, meant less to protect the patient than to protect the doctor or hospital against potential lawsuits. He cites the horrific, tragic death of 12 year old Rory Staunton, who died in NYC due to an infection that was not properly recognized and treated. Dr. Gupta eloquently argues for medical quality assurance through M and M's -- Mortality and Morbidity meetings in which medical professionals regularly discuss what has transpired in their hospital/practice, etc., so that proper procedures can be followed and lessons learned from mistakes made. My colleague, Dr. Soren Bisgaard, who passed away in December of 2009 of lung cancer, attributed to his childhood spent hanging around the shipyards of his native Greenland, edited a volume, "Solutions to the Health Care Quality Crisis," published in 2009. A few years back, Dr. Gupta withdrew his name for consideration for the US Surgeon General position..Perhaps one day he will reconsider -- although he already is doing incredible work not only as a practicing neurosurgeon, CNN commentator and reporter in the field, but also as a brilliant writer. It is truly frightening that, when people are most vulnerable, that is, when they are sick, that those that they trust and depend on -- the medical experts -- may let them down.